Hey SRCDS Forums! I would like to try and fix my error with my Garry's Mod dedicated server. Please read this entire thread. And also please . . .please! Don't tell me to buy a new router. Main Issue, is Server not Responding. But! Whenever people on my Hamachi network try to join me they can. And my server is not on the Garry's Mod master list. It shows up in LAN and is correctly identified in the legacy browser, but again . . . does not show in Legacy or Main browsers. 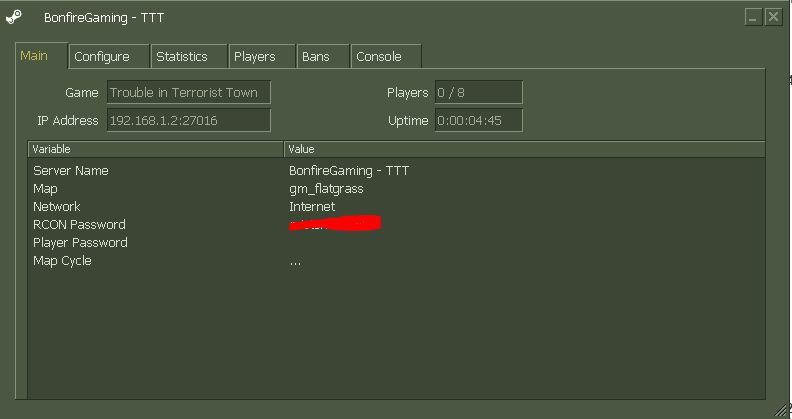 Quote: hostname "BonfireGaming - TTT"
rcon_password "***** Censored for obv reasons." I've no clue how to fix it perhaps you have to wait for some apt reply to this .. however looking keenly for any help come to you as it may also give me some clues into the same issue if i get into it anytime sooner.. If the IP that's assigned to your computer is 192.168.1.2, then the server IP address in your router's config needs to match that. Also keep in mind that 192.168.1.2 is not your external IP. To find your external IP, go to a site like http://ipchicken.com/ and it will tell you. Give that IP to your friends so that they can connect to your server. You may also want to try to restart your router after changing your port forwarding settings.